Having a control system which actively corrects itself is the most effective way to get the most out of the day while maintaining stability and predictability. It's sunny all day. The plant can reach its setpoint without any problems, and the inverters curtail the output at the same predictable rate all day. ‍It’s a partially cloudy day. There are a lot of shadows moving across the field throughout the day. The sun comes and goes in matters of seconds. The output fluctuates up and dips down as the controller responds dynamically to changes in irradiant potential. The real challenge is preventing overshooting on that cloudy mixed weather day. The clouds roll in and out. As they pass by, the controller will detect a drop in the output from the feedback loop. The inverters will receive a command to increase their output to compensate for the loss. The time it takes for the inverters to receive the new setpoint command, for them to increase their output and for the new output to make itself apparent in the feedback loop could add up to several seconds. Ages for the controller, which can mistake the lagged response for the need to continue to increase demand. The same problem occurs when the controller finally perceives it has exceeded the setpoint. It commands the inverter to reduce its output. A command which the inverter can begin to process immediately, but the effects of which must make it all the way back to the controller through the feedback loop before the controller catches on. This communication lag can cause overshoot and unstable oscillations which, left unchecked, will disrupt production and can cause risky fault conditions in the plant. We could mitigate this issue by having a control system which responds to irradiance very slowly. In that case, the output of the system wouldn’t be able to rise very high before the controller perceived the change. But such a configuration would be sluggish. A balance between speed and control should be struck to prevent overshoot while still having a responsive system. controller must aggregate and react to the new information and send updated setpoints to the inverters. How this information is transmitted varies depending on the protocol and medium. Once the inverters receive the new commands, they are limited by their own internal processing capability and ramp limits. Each individual delay doesn’t seem like much, but they add up. For reduced latency, skip the RTU. Invest in a feedback source which can communicate directly to the PLC with a protocol better suited for high-speed control such as EtherCAT or GOOSE. Configure poll rates with agility in mind. The expense of a quicker infrastructure and a rapid cycle is dwarfed in comparison to the efficiency and reliability gained. Ultimately, a PV Solar plant is a complex system exposed to a lot of factors which have a significant effect on performance. Many factors are outside our control or play off each other in unexpected ways. To fully understand how the plant will run day to day, invest in the time to review PV solar plants which are already running. 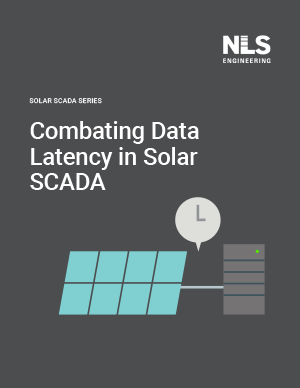 Consideration of Data Latency and equipment configuration in the design phase is a solid investment in a future-proof system which will produce consistent and reliable output for decades. Balancing processing speed with anti-wind up and PID tuning techniques make for a PV Solar plant which is both consistent and productive.